Home Complete Projects [3.6.16] Milkshake Machine Refurb. My Father gave me our old milkshake machine I grew up with as a christmas present. The goal of this project was to clean it up, and make it usable. 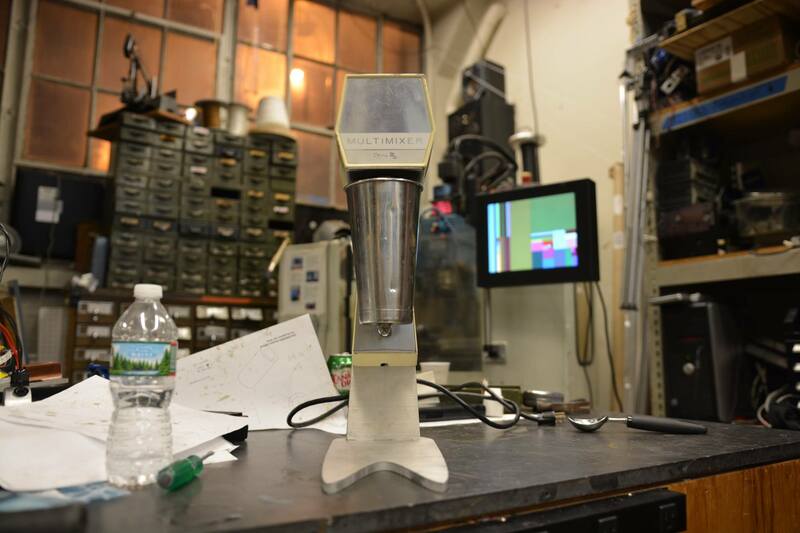 The goal of this project is to refurbish and increase the usability of a family milkshake machine. 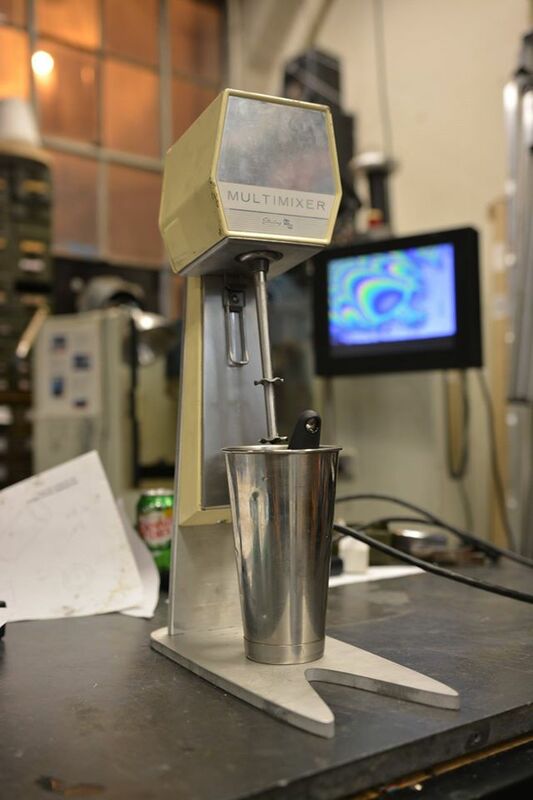 The milkshake machine in question is a Vintage Multi-Mixer Malt/Milk Shake machine made by Sterling (Sterling Multi-Products Inc.), but I have been unable to find any real record of what era this machine was made in. 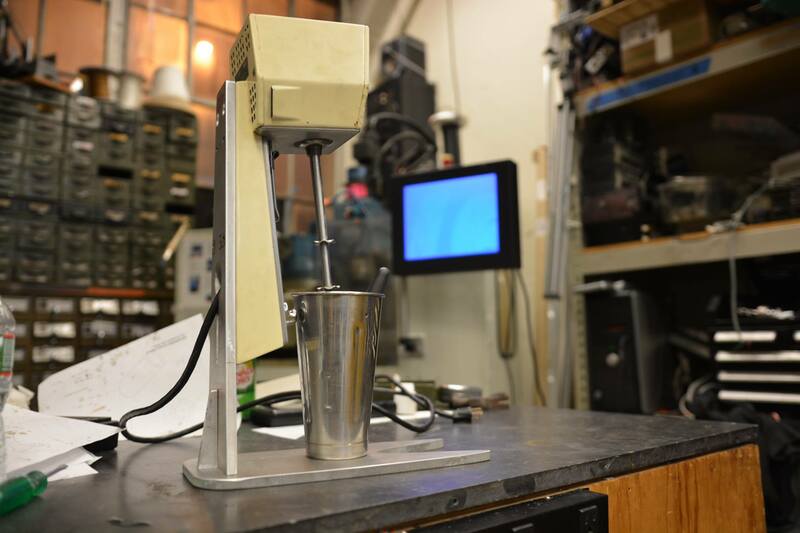 Overall the design of this milk-shake machine is that of a parlor wall-mounted machine. Over the years is has result in a delicate balancing act over the sink, and the occasional mess. (It is a very top heavy machine, just look at the pictures). To deal with this issue, I decided to design a dedicated Aluminium plate stand for it to be mounted to. Initial I did a tear down of the machine to clean off all the stainless steel parts as well as look for any failing parts. Overall, the machine was in great condition with only some minor chipped paint and dirty stainless components. I had thought about trying to stand down the non-stainless parts and repainting but decided against it for a mixture of sentimental issues and the worry I might not be able to get a better look than it already has. The stand was designed to attempt to blend the late 60’s/ early 70’s aesthetic, while also having enough mass and a large enough footprint to off-set its top-heaviness. For the back plate I decided to replicate the bolt patterns as well as the cable hole shape. Even though I did design the stand to be press fit together, i decided to weld the back of the parts together for added durability. Since these parts are all Aluminum the only choice in welding is TIG. My skill in TIG welding is very poor, and because this material is both aluminium and thick I tested out my settings on some test pieces. While unable to get a clean-enough weld I decided to ask my friend Michael [His Website] to help me with the welding of the pieces. With some dedication and patience he was able to do a nice and clean weld on the backside of the piece. In the end I decided to sand the faces of the aluminium plate but not to a buffed finish. Currently my Milkshake Machine is getting quite a work-out at [MITERS], bringing all the Undergrads to the yard. No matter the time of year, The Milk Shake Machine will come out during late night building and many milkshakes will be had.